After years of design and testing, here are the world's two most reflective solar tarps that will add energy saving comfort outdoors or indoors on the hottest days and reduce expensive summer cooling costs by as much as 35% on buildings, RV's, boats, animal enclosures, or open space below that are exposed to the hot sun. They create the ultimate cool roof or sunlit wall even in the hottest regions. Use outdoors when it is hot, then remove it in winter to add solar heat gain when you need it most. Many thousands of square feet of both of our CoolTarps have been sold around the world for more than 10 years, and it looks like our innovative idea is finally catching on, explained more in a recent science story from BBC news. The story explains how the Yang Lab at the University of Boulder Colorado has developed another type of highly reflective film that does exactly what CoolTarp does--reflect away most of the incoming sunlight and heat. As an added bonus, a similar type of Snow White CoolTarp is also used in our pure RainTarp drinking water kit, now in prototype testing. You'll be able to harvest and store delicious, safe rain water at home with this easy to use collection kit. Both fabrics are available to purchase below and they can also reduce winter heating costs and stay warmer by installing them indoors on widows and reflecting indoor heat back into the space. Another outstanding use is for plant growing indoors or outdoors to increase plant size and productivity by increasing light reflection from the ground, walls and floors. Want more natural free light in dark rooms? It also can be used as a daylighting reflector to send bright sun or shade through windows. This is especially helpful in winter months when there are less hours of sunlight. In blazing summer heat, it and our Thermal Barrier Fabric Thermal Barrier Fabric keeps plants cooler and reduces wilting and damage to the plants when suspended overhead. with stronger, lighter, more flexible SolaReflexx CoolTarp. Snow White CoolTarp and optional pressure grommets are available to order using the PayPal order links at the bottom of the page. With multiple weaved solid layers, it is 5 times thicker, 7 times stronger, is more durable and longer lasting, and is nearly as heat reflective as our SolaReflex Foil CoolTarp. It's better suited to larger, more permanent installations-including suspended over open spaces-with outstanding outdoor life of at least 7-10 years in all types of weather. Few other tarps can claim this amount of longevity, and normally only last a few months or a year outdoors before coming apart. 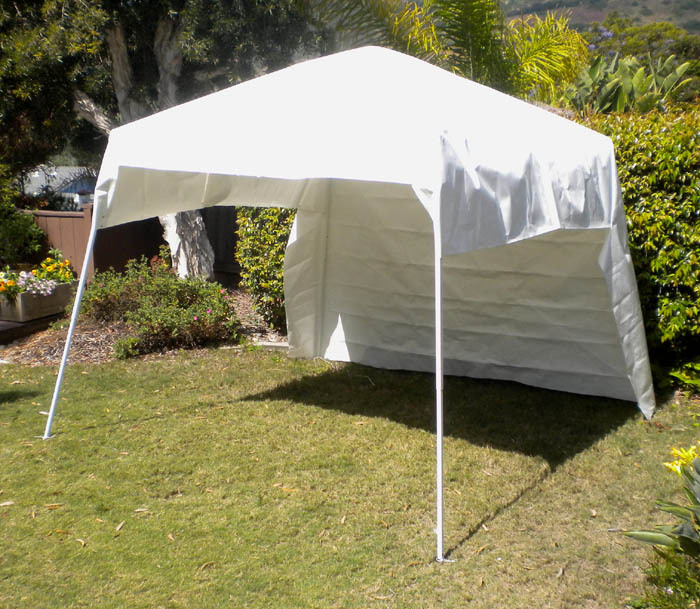 It has a variety of other uses as well, such as covering your car, RV, boat, pop-up (seen in photo on right), or patio cover, and comes in 12' widths up to 300 feet long. And for indoor food, flower or pot growers, cover the floor with Snow White CoolTarp to reflect light back to the plants while protecting the floor. Attaching SolaReflexx CoolTarp to the walls reduces light absorption and reflects otherwise lost light back to the plants, which helps increase growth. 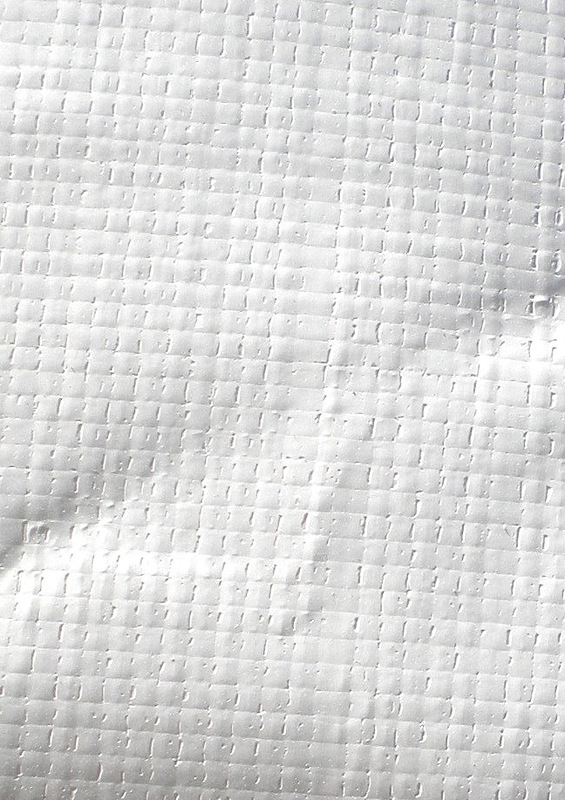 Compared to standard utility white tarps, the added thickness and unique multiple UV resistant co-extruded layers allows only 10% sunlight to pass through CoolTarp, increasing resistance to solar heat penetration. Surface roof or wall temperatures under super bright Snow White Cooltarp average about 15-20 degrees F cooler than conventional white tarps. Use the PayPal order links below to place your order. Send your questions and request a product detail sheet by clicking here to send an email to solar thermal designer Deris Jeannette at: deris@cleardomesolar.com. Using either CoolTarp in summer creates passive solar cooling by reflection since no other energy source is needed to reduce solar heat gain. While white painted roofs or walls will reduce solar heat gain when compared to a typical dark colored roof, either SolaReflex CoolTarp on covered roofs or walls will further reduce solar heat gain by as much as 35-50% more. Permanent white painted or coated roofs, called "Cool Roofs" work best in summer and are proven to reduce solar heat gain when it's hot, but in cold winter months white reflective roofs have a negative effect on daytime solar heating that helps warm the structure, increasing heating costs. For more information about the cool roof concept, search for "cool roof coatings" or click here to read a detailed Pacific Gas and Electric brief about the proven benefits of cool roofs. That's why installing CoolTarp for summer and removing it in winter is advisable in colder regions. Coated cool roofs cannot be removed in winter. Painted and coated roofs also begin loosing as much as 30% of their high reflectance after 1-2 years because of dust and dirt buildup from dusty winds and from stains, while CoolTarp is very stain resistant and can be easily cleaned on the ground or on a flat roof with soap and water and a broom before each summer installation to preserve the high reflectance. Compare typical white roof visible reflectance of 60-80% and 90% emissivity to SolaReflexx CoolTarp's 95% full spectrum solar reflectance which includes heat generating infrared (IR) light and super low (3%)emissivity. The higher level of reflectance, and lower the emissivity, the less solar heat can be absorbed and stored in the roof and wall structure. Our tough, weatherproof, UV and IR resistant radiant solar heat reflector product is called SolaReflexx CoolTarp because it's made from our top-rated reflective diffused SolarReflex reflector foil that's been time tested by our many customers and scientists, and has been in use around the world for over 13 years for a wide variety of solar projects. You won't find a more reflective flexible tarp or roof covering than either CoolTarp. This highly reflective, flexible material offers energy saving and comfort advantages in both summer and winter because radiant heat inside or outside a home or business travels the quickest through windows--even through low E and multiple glazed glass. Suspending CoolTarp near windows reflects, and not absorbs nearly all of that radiant energy back to the direction it came from before touching the glass. Less reflective solid surfaces, even insulation, absorbs heat and eventually it passes through to the other side. SolaReflex CoolTarp makes an outstanding "fourth wall" for uninsulated garage doors or when installed inside the door in freezing cold weather. It reflects most of the room temperature heat back into the space instead of allowing it to be absorbed by the door and lost to the freezing outdoors. 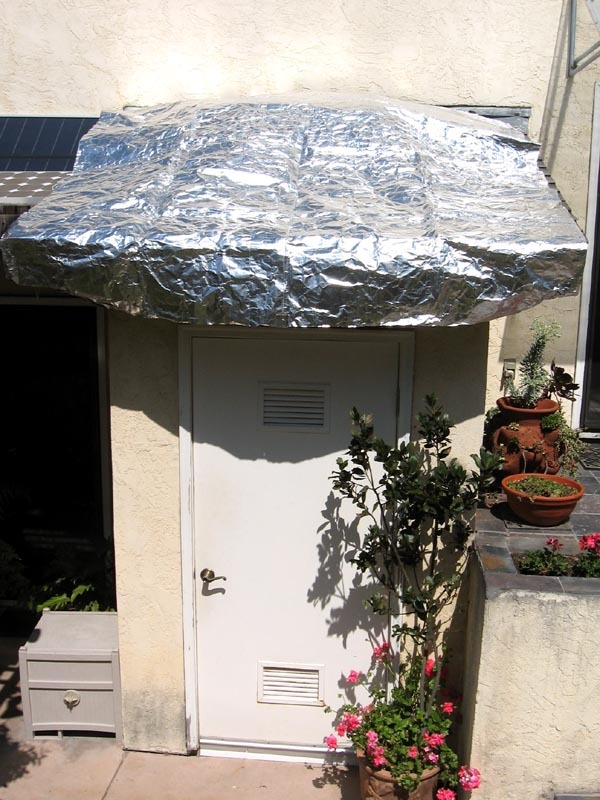 If you have a passageway from a lower floor to an upper floor that has no door, installing a temporary CoolTarp "door" where the cold or warm air would normally pass through, a true thermal barrier made from CoolTarp can stop nearly all of the cold and hot air drafts from passing from one space to the other through the opening. It can actually be more effective than many insulated walls by preventing most of the heat absorption on the cold wall surface. It's about 30% more effective than our top-selling 70% reflective Thermal Barrier Fabric, but it will completely block the view outdoors and no sunlight will pass through it. And consider the many other practical uses in summer or winter over pet enclosures, greenhouses, garden plants, sensitive electrical boxes, emergency use areas, and more! It's not a painted or colored surface like all other tarps, tents, or roof surfaces that will reach 125-175 degree F temperatures that you can feel below, it's a triple-laminated tarp with two highly reflective metalized surfaces coated over a super-strong "rip stop" weaved but solid plastic sheet specially coated with our metallic SolaReflexx reflective material. Nearly all the intense incoming solar energy generated heat is reflected away before it has a chance of being absorbed by the roof or surface or area underneath. Custom larger sizes of both CoolTarps can be ordered by using the bulk order links below. SolaReflexx Cooltarp is 8' wide and discounted bulk sizes up to 200 feet long are available, while Snow White CoolTarp comes up to 300 feet long. You can cut either CoolTarp to fit using scissors or a knife, and cut openings for vents, HVAC components or antennas where needed. Here is an example of a very large installation of SolaReflex CoolTarp (right photo) that measures 22' x 23' temporarily installed on a flat roof above an office space that gets very hot. We used 1' square clay tiles to weigh it down to prevent wind interference. 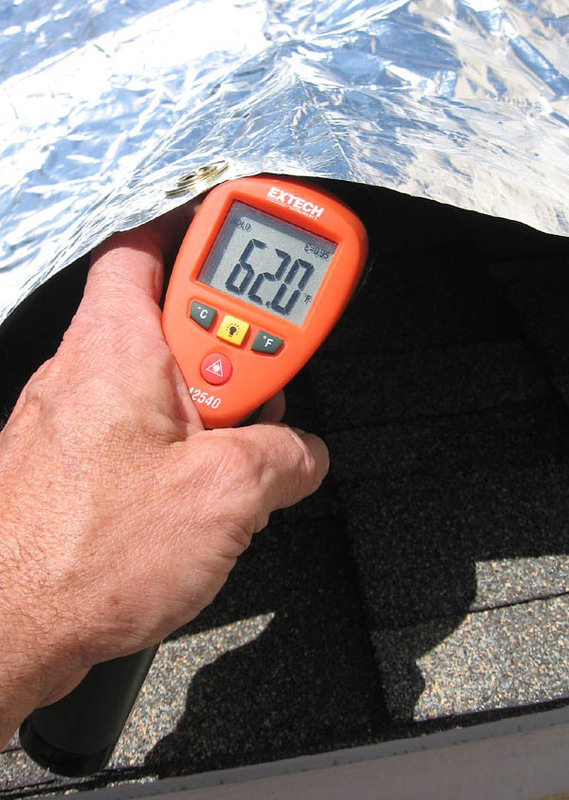 On a 78 degree F day, the roof reached 155-160 degrees, but once the SolaReflexx CoolTarp was installed it dropped to nearly 110 degrees, even with the saturated heat already stored in over 2" of insulation below the roof deck. Custom bulk sizes are 8' wide at $1.35 per square foot. All other outdoor tarps (including the silver painted and light colored tarps) roof coverings and shade cloths absorb or transmit considerable sunlight and convert it to heat, which radiates downward, heating the space below. The sun's direct radiant energy is reduced, but the absorbed heat will still add ample warmth below. CoolTarp stays the coolest It also is has very low emissivity at .03, far lower than any painted or applied surface. This is one of the most effective ways to eliminate "heat islands" in cities that contribute to global warming. For more information on how to use and signon to PayPal please click on the links below. Please use these secure PayPal order links to place your order for both CoolTarps. Our new upgraded and improved SolaReflexx CoolTarp is now available in 8' width, with bulk lengths on request for up to 200 feet. The minimum width for bulk Snow White Cooltarp is 12', with lengths up to 300' long. Don't forget to indicate the bulk size dimensions in square feet (length x width) when you place your order. The default shipping cost is for standard size orders. Larger bulk orders will cost more to ship, especially when shipping overseas. 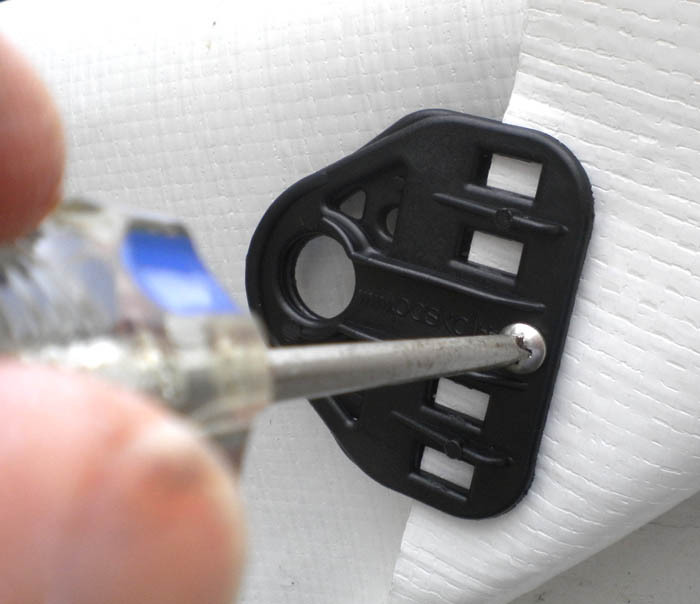 Removable pressure grommets are like a clamp and are stronger than hole grommets. They are easy to install and remove using pliers in the 1/2" hole to close and a flat screw driver between the top and bottom to open. For 50% filtered sunlight and 70% solar heat reflection, have a look at our all-season 70% reflective fabric that's very affordable and easy to install on windows, patio covers or in open areas with no shade, just like with CoolTarp. It's called Thermal Barrier Fabric, and you can see it, and over a dozen of our unique solar thermal products you can use at home or on the go. It's available to order now by clicking here to jump to our thermal fabric web page. 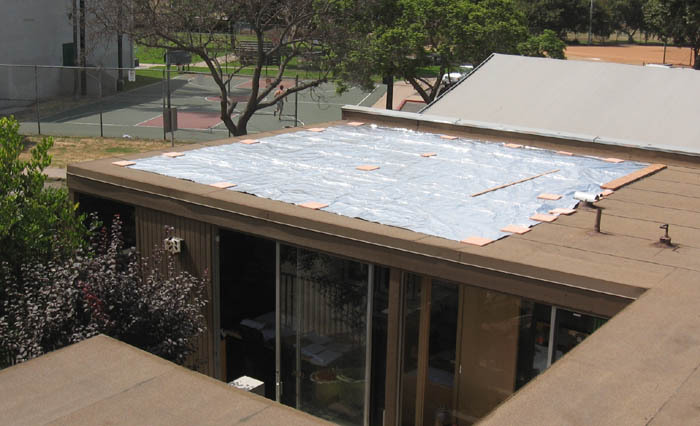 Imagine reducing searing hot summer roof temperatures that normally heat up to 150-180 degrees F, to within 15 degrees of the ambient air temperatures when CoolTarp is suspended above it or sitting on the surface. So on an 80 degree day, the roof surface and structure below will only warm to about 95 degrees when CoolTarp is above it, which is about 65 degrees cooler than a solar-exposed roof, without using any additional energy. 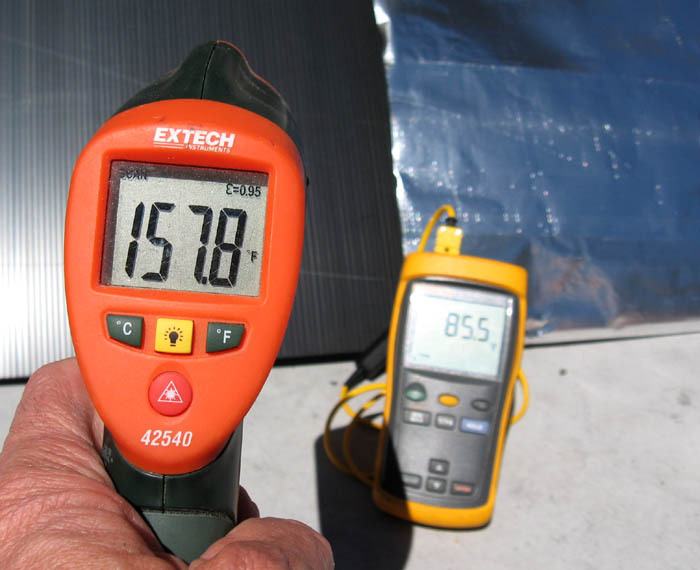 In this demonstration photo you can see the surface temperature of a thick black plastic sheet (represents the roof surface in summer)on a 75 degree F day reads 157 degrees F using an IR Thermometer, and underneath the SolaReflex CoolTarp the surface on the right side, the temperature is only 85 degrees as shown on the thermometer after sitting in the sun for more than an hour. This is a 72 degree drop in temperature by suspending CoolTarp an inch above the surface. If CoolTarp touches the surface, temperatures will be slightly higher (10-15 degrees F) because a small amount of heat conducts through to the surface. It works just as well over numerous other areas like tents, patio covers, sun-exposed windows, boats, RV's, electronic enclosures, plants, and animal enclosures. As a top-rated reflector product, it can also be used for Solar Daylighting, where dark rooms can be lit up inside through windows or glass doors when it's opened on the ground or pulled secured on a nearby wall or fence. It's actually fire resistant, and can withstand radiant heat temperature above 350 degrees F.
This method of passive solar cooling will keep building interiors much more comfortable and reduce the demand for expensive air conditioning. It prevents excessive heat storage in the roof structure during the day, which eventually passes through into the attic and radiates into the rooms below. That's why even well-insulated buildings warm up and stay warm on hot days--the heat will eventually travel through the structure. Here is an actual roof test on a small attached utility room that has a standard composition shingle roof. At 1pm on a 65 degree F Spring day, the roof surface underneath CoolTarp roof is 62 degrees F after nighttime temps in the low 50's. The thermometer is a heat-sensing IR thermometer. 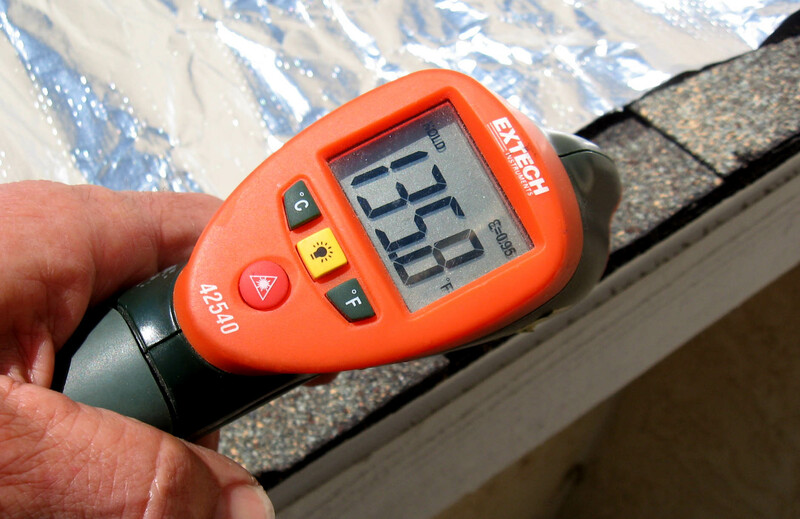 The center photo shows the actual sun-exposed roof temperature at 135.8 degrees F and the right photo shows the room covered with the Cooltarp. This shows a 73 degree temperature reduction under the CoolTarp covered roof, and that adds up to quite an energy savings on cooling costs. A closed skylight under the tarp helped to elevate it above the roof surface. The darker the roof, the more noticeable effect from this durable foil. Sun-exposed windows allow the most solar heat gain inside a building, so cooling them with CoolTarp is even more dramatic. It works best mounted outside the window, or overhead as an awning to prevent the sun from touching the glass surface. 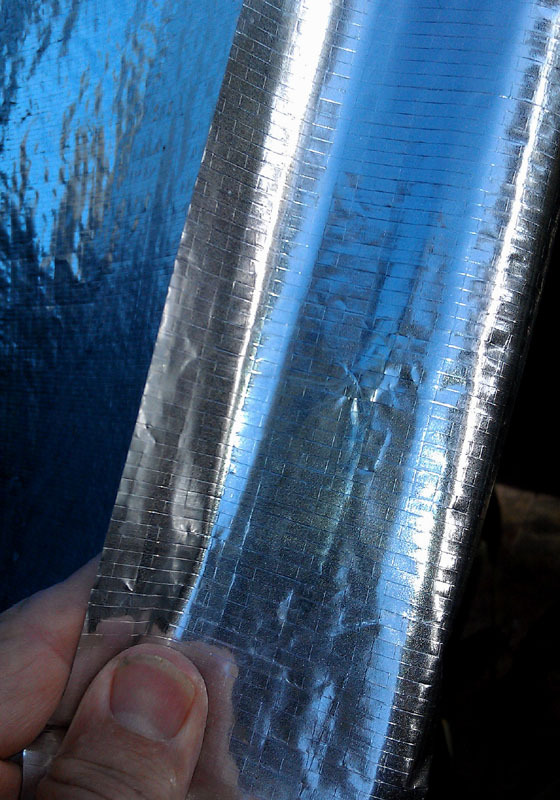 This is a similar type of reflective radiant barrier foil that was used to help keep the early astronauts stay more comfortable in outer space--inside their space suits and on their space craft. Our product is even more durable, fire resistant, tear-proof by hand, but easy to cut with a knife or scissors. By lowering window, roof or wall temperatures and eliminating UV or IR wave sunlight contact using our reflective shading material, the life of the structure will be extended. SolaReflex CoolTarp can also be used as a sturdy survival cover or blanket formed into a lean-to or tent, and when wrapped loosely around humans, drastically reduces heat loss in cold environments in survival situations. This is the ultimate radiant barrier product, and the best performance is when it's suspended in air, not touching any objects except on edges or minimal support structures. For larger custom size CoolTarps we suggest securing, then rolling the longest ends on a pole or smooth board to better distribute wind stress. For surfaces larger than that, its better to make two small sizes instead of one larger piece. If you plan to cut the assembled CoolTarp to fit a specific space, you can cut to fit and add your own grommets from any grommet kit. 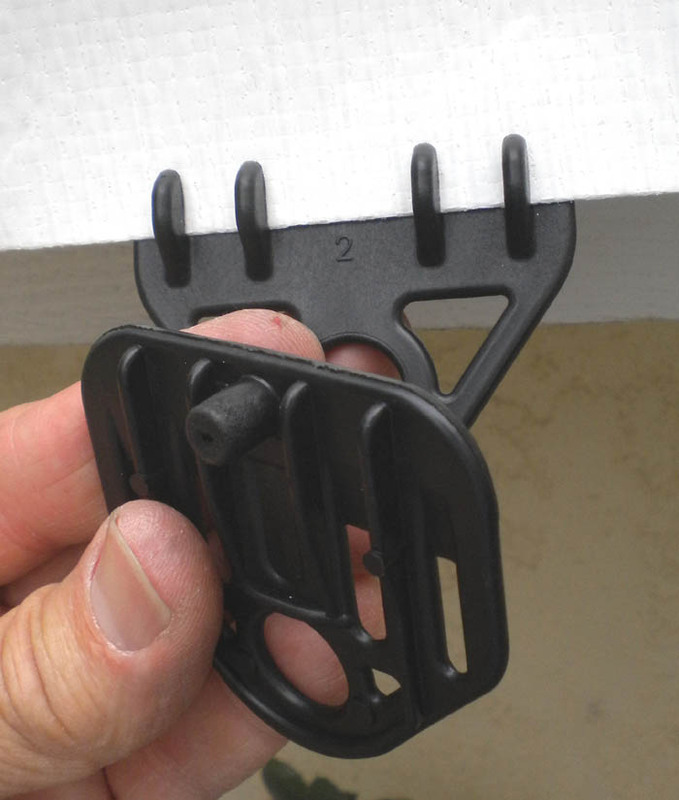 Holes should be cut for vents, antennas or other items mounted on the roof or wall. To learn more about out other unique, high quality solar thermal products like our solar forced air heaters, solar cooker, reflector fabrics and heat absorbers, please click here to jump to our home page or below for our product pages.